Susan Keefe reviews novels and non-fiction books for The Columbia Review. 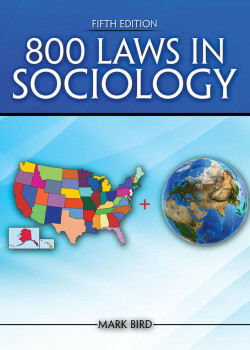 800 Laws in Sociology by Mark Bird is a unique and ambitious book that covers no less than 74 common social science topics in an accessible, readable style, including traditional subjects as well as topics not often covered in general social science books, such as Amish culture, Hispanic culture, FBI crime factors, teen pregnancy, parenting, love, war, religious trends, early Christianity, college benefits, environmental issues, and predictable future trends (concentrating on the United States). The book also includes 44 tables and a glossary. Author Mark Bird is a professor of sociology, who has also published over 30 articles, primarily about water and new desalination techniques. What I really love about 800 Laws in Sociology is that it has been written not only for students in college sociology classes, but for members of the public. As such it is penned in an interesting and reader friendly format, a style more akin to an interesting magazine article than what one would find in an academic journal. The author clearly aspires to inspire people to dip into it, depending on what subject they are studying, or pique their interest at a particular time. I personally discovered that it offers a wonderful introduction into the world of sociology. Although called laws, the ‘laws’ are not laws in the legal sense, but generalizations based on the observation of repeated events. Also they are made up of factors, patterns or principals which clarify a particular social science topic. Examining documented research since sociology was founded, studying the observations of the great sociologists over the years, analysing research, observing trends and scrutinising data, the author presents the reader with a wealth of information. Per 1,000 words, this book may have more social science content than any other book. The content of each of the “laws” is extremely interesting. I found it fascinating to discover how popular trends, social development, prejudices, world event and the myriad of other factors, have influenced over the years, in good and bad ways, people’s interpretation of subjects and events. The author also encourages his reader to look further into each subject at the end of each topic by adding ‘Critical Thinking,’ to go that extra mile with your deliberation, almost as if he knows how fulfilled you will feel when you do. Near the end, the author shares with the reader the ideals of August Comte and Emile Durkheim, two of the most important founders of sociology (which Comte called “Social Physics) and contemplates that it is likely that they would favour the ‘laws’ approach to the subject because it is more amenable to verification and falsification. This clearly demonstrates the vital link between theory and data, fosters greater respectability in the discipline, and also has a greater potential to improve society via public policy changes. Covering topics such as culture, socialization, group, deviance, stratification, gender, ethics and minority, politics, marriage and family, religion, education, health, democracy, environmental and sociology of the future, there is something of interest for everyone within the pages of this truly engaging book. With quotes on science, informative tables and data, and a very good glossary, this book should be on everyone’s bookshelf. Highly recommended!